Virtual Reality has been a burgeoning topic for months now, but Augmented Reality is suddenly red hot, too, due to the instantly ubiquitous Pokemon Go app. With both “realities” becoming so popular so fast, the need to understand audio in the presentation of each is crucial for anyone who hopes to work in those emerging fields. As a result, the Audio Engineering Society’s upcoming inaugural International Conference on Audio for Virtual and Augmented Reality has become a ‘must-attend’ event. 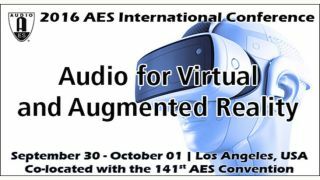 With that in mind, the AES has unveiled an expansive program of technical papers, workshops and tutorials for the two-day event to be held on September 30 and October 1, 2016, co-located with the 141st AES Convention at the Los Angeles Convention Center’s West Hall.